My husband has always used smelly, oil based sealers on our fence and old deck. 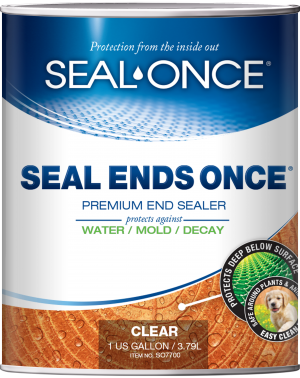 After we installed a new deck in 2018 , we loved the idea of a safer, water-based sealer like Seal Once. 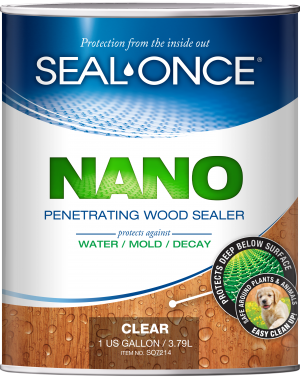 Not only does the deck look great after using Seal Once, we love that it is not full of toxic chemicals, since our family and dogs spend a ton of time on the deck. I did a lot of research prior to choosing Seal Once for our deck. I was initially leaning toward an oil-based product they sell at home depot, but went with the NANO+POLY after doing more research on-line. Though water-based, it penetrates well and has easy cleanup. Knowing you can get a water-based product that works as well as an oil, makes it an easy choice for us, even when the cost is a bit higher. It was very thin and watery when I opened the can, which worried me a little at first, but the bronze cedar color we used is beautiful. It looked nice after the 1st coat, but absolutely gorgeous after the 2nd coat. Water beads up on it after a rain shower and the product is warranted to hold up for up to 6 years on horizontal surfaces. The customer service rep was very helpful and I ordered 4 different color samples to try out. I would not be put off by its cost as this is a product meant to protect your deck for years. It’s worth every cent (and you get what you pay for)! Also, the estimated coverage per gallon was really accurate, so I did not have to spend money on sealer I did not use.